For over a decade, Sunny Health & Fitness has been the premiere distributor of high quality health and fitness products. 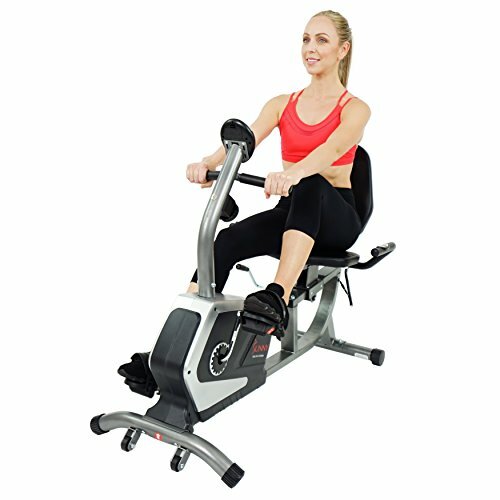 With the SF-RB4616 exercise bike model, the manufacturer keeps your workouts on track with an efficient and cost-friendly recumbent bike which is comfortable to use and adequately gets the job done. For people who have always wanted to own a recumbent bike but felt it was above their range, Sunny Health & Fitness has released a model that will fulfill those wishes without denting their bank balance. This versatile and reliable recumbent bike with arm exerciser has a large seat and back cushion with adjustable height for users and various sizes. It also lets you control your workout intensity by allowing you to choose between 8 different levels of adjustable magnetic resistance. 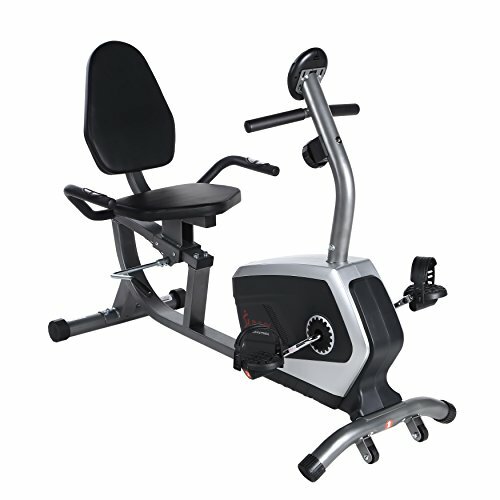 Let us not waste time any further and quickly jump into the features of the RB4616 model so we can see what makes it such a special investment for the user looking for a quality recumbent bike for their home. When fully assembled, the SF RB4616 model measures at dimensions of 54.5 x 26 x 39.5 inches of length, width, and height respectively. Built in wheels are at the bottom of the bike which makes it much easier to transport the bike from one place to the next. Though the bike itself weighs 59 pounds, it is capable of accommodating users of max 300 pounds in weight. This capacity means most people can use this recumbent bike to achieve their fitness goals. Special care has been given towards the design of the bike and the comfort it can give to users. The padded seat of the RB4616 is large, wide, and adjustable in position. It is designed in such a way that prevents backaches by keeping your posture upright. With the help of the adjustable handle found on the lower side of the seat you are positioned on, you can adjust the seat forward, backward, upwards, and downwards while sitting. The handle makes it very easy as you will not have to pause your pedaling in order to adjust your position. With the help of adjusting the handle, you can now set the seat’s posture while you are in the middle of working out. A small display is found on the console that helps track vital exercise readings such as total speed, time, distance covered, number of calories burned, and heart-rate of the user. The display however is not backlit so it will be testy at times to track the readings in low light situations. The handlebars of the SF RB4616 are padded and firm for ease of grappling. The handlebars also feature pulse grip sensors that record your heart-reading and displays it on the LCD console. Through the help of the pulse grip handlebars you will be able to keep track of your heart rate and measure the level of effort you are putting in, as well as the amount of workout that is effective for you. Right beneath the handlebars you will find a knob that lets you choose between 8 different types of resistances. The knob is adjustable and by turning it you can alter the tension in the knob and subsequently increase or decrease the total resistance. Using this feature, if you increase the resistance you will have to pedal harder in order to burn the weight. Similarly, if you decrease the resistance you will have to apply much less force when pedaling which will result in a simpler, less-exhausting workout. Because the Sunny Health & Fitness RB4616 model is equipped with a Quiet Drive belt system, you can remain convinced that the bike will make minimal noise and will allow you to pedal smoothly. This removes the risk of disturbing others living in the house and allows you to work out while also multitasking or watching TV. It does not matter if you are a seasoned veteran or someone who is just starting out with working out on an exercise bike because the Sunny Health & Fitness RB4616 model has everything that a solid and decent recumbent bike could offer. With the eight level resistances, adjustable chair, heart-sensor handrails, and a display that does its job at tracking readings, you are getting everything and maybe a little more for the nominal price you’re paying for it. It comes highly recommended! 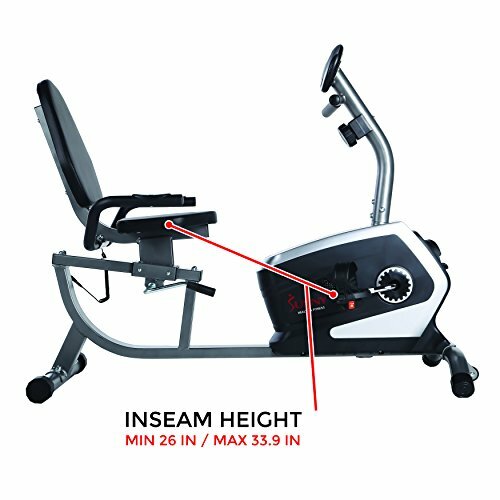 An affordable price tag brings the best features of a quality recumbent bike together into one worthy machine.